Once again, Christmas is almost here, and I have done a terrible job creating that magical environment that my children will look back on fondly. Oh well. I guess I’ll never have that picture-perfect Pinterest house and Pinterest family. As a blogger who thoroughly enjoys keeping it as real as possible (in an attempt to prove that not all bloggers have a perfect life), here are a few Christmas confessions. 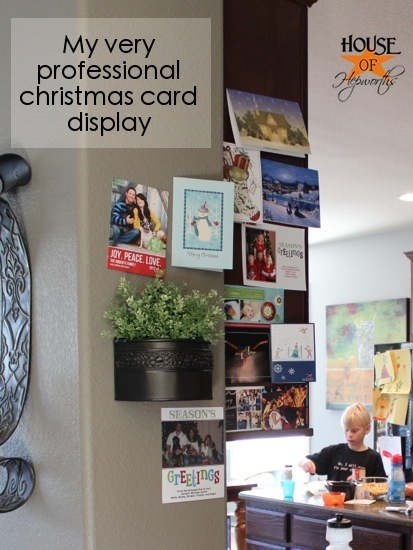 I used double-sided tape to hang all our holiday cards… on the side of a kitchen cabinet and the wall. I used my mini nutcrackers as Christmas Tree ornaments instead of card holders, and I’m too lazy/don’t care enough to make some adorbs card holder display. So the cabinet it is! And Confession #1.1: I never even attempted to make or mail out cards this year. There’s always 2013. 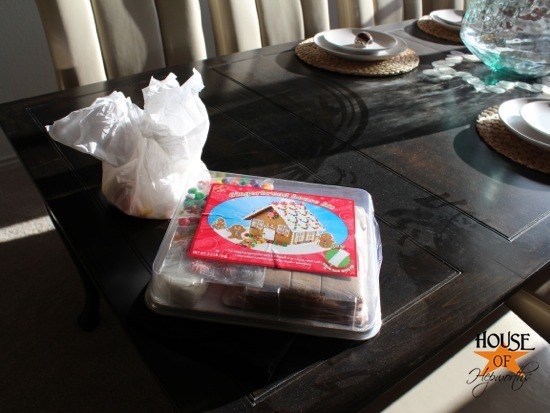 As of December 21st, we have yet to open or decorate the Gingerbread House. At least we have it. That counts for something, right? 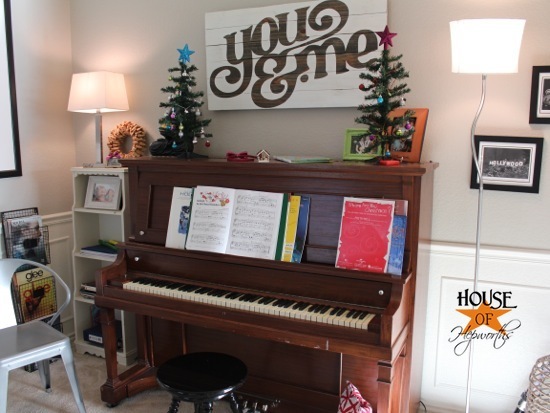 The extent of the piano room decorations are only there because they didn’t quite make it upstairs. Those mini trees? They are the kids’ trees. They ended up on top of the piano as a temporary drop off zone on the way upstairs. They do look cute on the piano though. And speaking of piano room decor, check out the other awesome decor on top of the piano. The headband really completes the holiday ensemble. I stuck the majority of the decor on our sofa table. The remainder of the decor never made it out of the plastic bin. I had good intentions, I swear. And my house, holy cow this place is a wreck. If I can just have one solid, uninterrupted day, maybe I can get this place picked up. Oh, you know, just piles of gifts sitting on the entertainment center for the world to see. At least they aren’t for my kids. I hope my nieces and nephews don’t read my blog. I did manage to decorate inside the entertainment center. 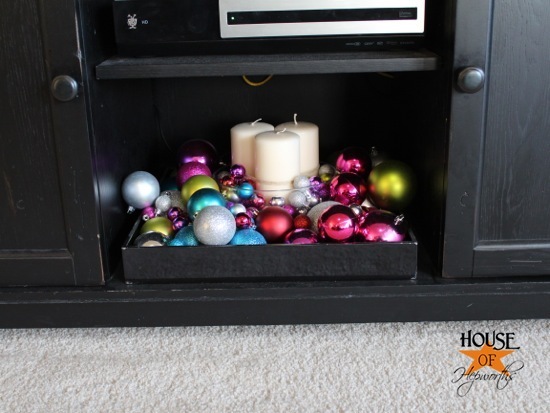 One tray, a few candles, and a bag of plastic ornaments = cute holiday display. There is an entire section of lights out on our tree. And it’s been like that since we pulled the tree out of the box and set it up a month ago. I just don’t have the patience to try to figure out which burnt out bulb is the culprit. But when I do, trust me, I’m giving him a stern talking to. Naughty bulb. Our fireplace hearth is decorated with Legos and advent calendars. 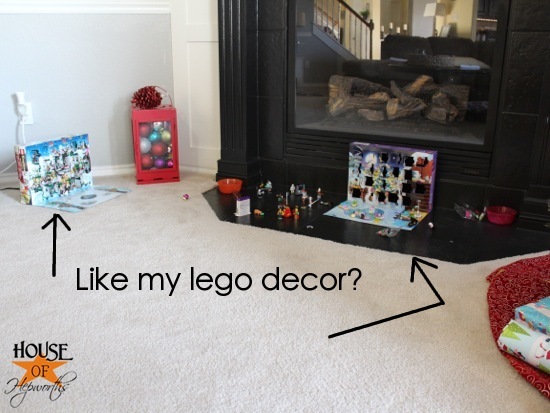 Legos are great holiday decor!… Said NO ONE. EVER. Pillows are the bane of my existence. My kids and I play this game: They throw all the pillows on the floor. I come pick them up and put them back on the couch. Repeat about 25 times a day. Today? I’m just leaving them there. What’s the point anymore? I labeled the gifts with a sharpie. I swore two years ago I would stop using sharpies to label gifts. Yet here we are. The new tree ornaments, well, they speak for themselves. Every year the kids each pick out a new ornament. Our son’s never got a picture put into the “O” and the tag is still on it. I can’t even speak of my daughter’s ornament. I let out an audible laugh when I saw it on the tree. 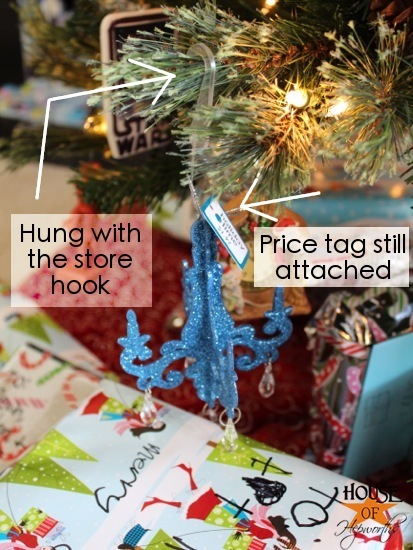 Not only is the price tag still on it, SHE USED THE STORE DISPLAY HOOK TO HANG IT. My kids will be getting a visit to the dentist for their birthday. Advent calendars are freaking expensive to fill, especially if you get little toys. So they get candy. 25 days worth of sugary candy. I have lovely friends who gave me Poinsettias. We have no Christmas lights on our house. But I did decorate the porch, that counts for something. Right? The tree fell over the other night during a strong wind storm. I made a conscious decision to not pick up the remaining ornaments that fell off, because I just didn’t feel like it. I am that lazy this year. What has gotten into me? 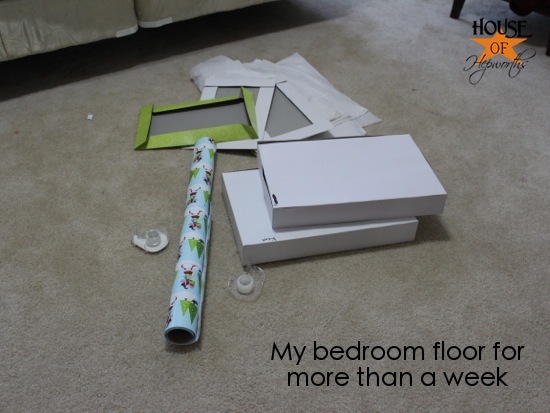 I’ve lived with wrapping paper chaos for a week. I need to finish wrapping stuff. But I ran out of tape. And even though I’ve been to the grocery store or Target no less than 5 times since then, I still can’t remember to buy more tape. The kids trashed the game room last week when they wrapped gifts. I have been ignoring the room since then. I’ll make them pick it up eventually. After I have a nap. There you have it. 16 reasons why I am a terrible holiday-er. Lots of bloggers totally have their sh** together and have lovely decorated homes and cookies in the oven. I am not one of those people. There’s always next year. Of course, that’s what I said last year. And the year before that. If I haven’t done it by now, it isn’t getting done. And I’m perfectly okay with that. Have a very merry christmas. Peace out. 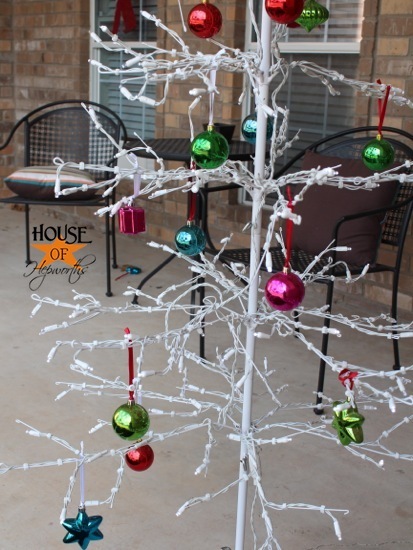 Try the Light Keeper Pro for your tree lights. I bought one last year and so far it’s fixed every issue we’ve had with lights inside and out. If you wait until after Christmas it will be much cheaper than the $18 I paid for it (but it was well worth the sanity savings). Lowe’s, Target and probably Wal-mart carry it. Thanks for posting this bit of info. I have never heard of the Light Keeper Pro. I definitely need to buy one! Lol! I totally feel you on this one. 🙂 As far as Christmas decorations go, we put up a tree, hung both of our stockings, and hung up a bow with a ribbon which I clothespinned our holiday cards too. And I took an extra string of lights and put it up in our window, but it only goes 3/5 of the way around, and I couldn’t be bothered to go get another strand, or redo it so it doesn’t look like we ran out of lights. 🙂 My fall decor is still up. I don’t have a tree skirt. I definitely used sharpies to label presents (at least they were metallic!). I’m pretty sure I’ve never dusted this apartment. But Christmas is going to be awesome anyway! Ha! Right there with you! It doesn’t help that EVERYTHING on anyone’s blog right now is some fabulous Christmas decoration. I just keep pinning things for next year and pretending I’m actually going to do it all then. When I have an 11 month old. Right. 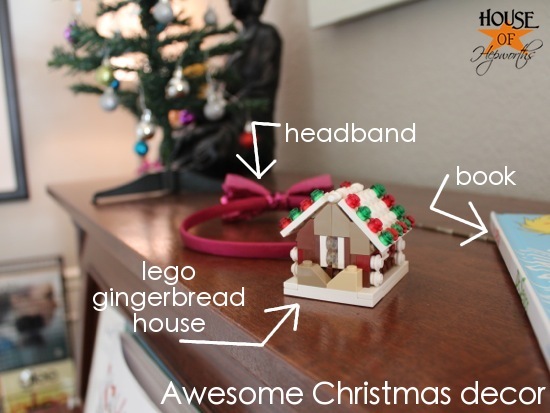 I love the lego gingerbread house; it’s adorable! I love it! It’s so easy for blog readers to start feeling inadequate because we see only the pretty and perfect, which isn’t always reality. 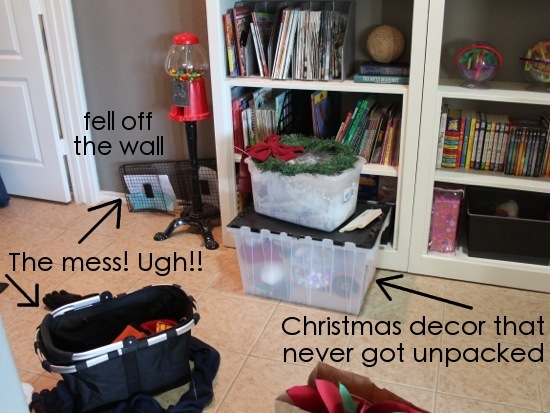 It’s so nice to see and hear that one of my favorite bloggers is just like me, with the sharpies and wrapping paper piles and incomplete decorating. Thanks for keeping it real! Oh Allison, I just LOVE YOU. Yes, yes I DO! My favorite is the wire bin that fell off the wall. Had me ROLLING! 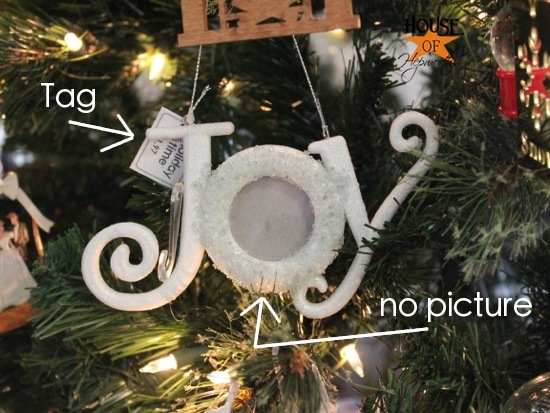 And the tags on the ornaments, I LOLed alot. Merry Christmas friend, from another unorganized, lazy mom! Love this Allison. Totally can relate. The top quarter of our tree has dead lights too. I figure I can fix it when I take the tree down. Plus we have a preschooler this year obsessed with making ornaments so we have lots of really interesting DIY 4 year old ornaments. 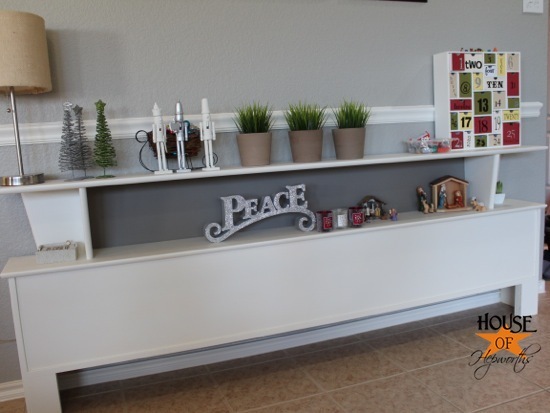 This year I scaled way back on the decorating, shopping, crafting. It’s so hard to be on top of everything. Sometimes having a not picture perfect holiday is the only way to have a perfect holiday. I loved this post. lol So funny! And I can totally relate to the whole pillow thing. Makes me (and the husband) crazy. I finally did something sort of nice with my kitchen table (for like the first time ever) and after a few days it was trashed and now it’s just piled high with crap. My cute centerpiece is still there but there are crumbs and all sorts of misc stuff from the day on it. 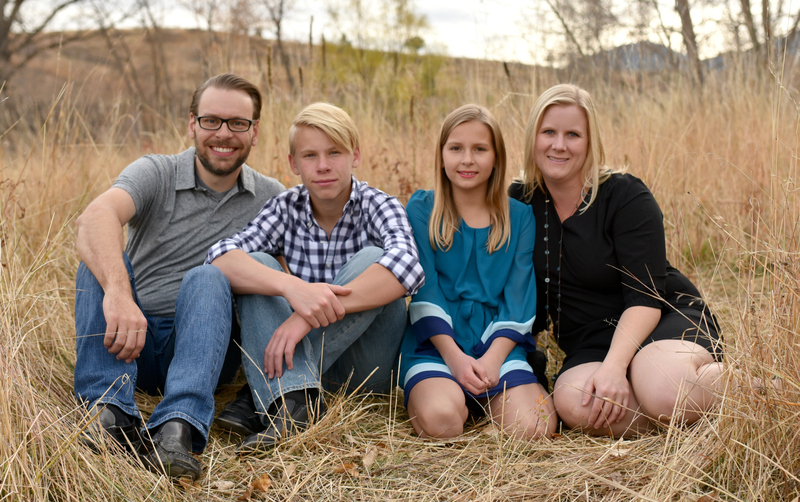 As much as I try, I don’t think I’ll ever be the perfect blogger with the perfect house and the perfect kids. lol And that’s fine. 😉 Merry Christmas to ya! Oh, it’s funny and odd tho… I haven’t been on blogger for well over a month due to a lack of time, and this was the first post in the news feed… so it truly was ment to be! This post made me feel so much better. I see so many blogs that show off their beautiful Christmas decor and I feel like a failure. I have my tree up and the stockings are hung, but I have neither the desire or energy to do anything else. If it weren’t for my 2 sons (ages 8 and 2) I wouldn’t even do that much. It is so much work and then you just have to put it all away again. I took a lot of of Christmas decorations to Goodwill this year because I get tired of going through it to find the few things that I want to actually use. Thanks for keeping it real for your readers. I’ve been reading your blog for a while and I don’t comment, but I couldn’t help it on this one. This made me laugh, out loud, multiple times. This could be my favorite post you’ve ever done. Ever. Not to mention I could relate with so many of your points and I guarantee I’m not the only one. Anyone that appears to have it all together is probably just lying. Thanks for the laughs and Merry Christmas! I think some of those photos may secretly have been taken at my house. Especially the gift wrapping after-math. Love it!! You just made my evening! I am suppose to be at a Christmas Party but I am home with a sick child staring at a tree that is no longer decorated on the lower half with a pile of stockings laying below the mantle with all the throw pillows all over the floor. I am glad I am not the only one that doesn’t have it all together! That was hilarious! 🙂 Some years is that bad, some others is even worse! I can totally relate to seven of your confessions! My main floor is picture perfect but the rooms up-stairs and basement are a mess! Merry Christmas Allison! While wrapping presents this year, I couldn’t find the tags and couldn’t be bothered to go get a sharpie but I had lots of different wrapping paper so each person has a different paper – no tags, bows, or even sharpied names 🙂 love this post! Oh my! My cheeks HURT from laughing so much! Thank you for sharing your real life, it is awesome to see that people on blogs have real lives too. Blessings. Oh, and I sharpie almost all my tags, they’re never lost that way! I love your post!!! I don’t think anyone ever has it all together. At least I know I don’t. I turned on the lights on my garland on the mantel and a strand is out! No way am I going to attempt to fix that now!!! My husband was working out of town for seven weeks and came home last Friday. Our outside lights are still not up. I did manage to decorate the porch and put out Mickey and Minnie signs with a spotlight. Oh well, there is always next year!!! Just remember to take care of yourself and have fun with the kiddos! I just wrapped my first present tonite. The few others I have gotten I stuck up in the top of the closet. Must finish the shopping tomorrow, so I put gift bags on my list! I have no tree and have not even gotten the deocrations out of the garage. 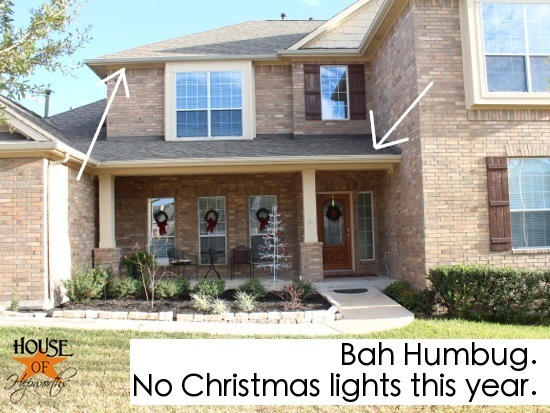 Truthfully…I have not decorated for Christmas for the past 4 yrs! My living room has over 10 boxes that have ornaments, dinner stuff of crafts. Half the boxes are empty or with house stuff put in them to make room for all the Christmas stuff. When we were buying my daughter gifts, Thursday night, I was looking at what Kohls had in the Christmas section. My husband kept on saying why are you looking at this stuff? We have over 10 boxes of Christmas junk. Get this…with all the boxes and bags I still can’t find my daughter’s stocking. Luckily she’s 15 and not 5!!! I told her, if we still can’t find it after cleaning out the garage, I’ll get you a new one from Lands End (to match ours). lol I promised my husband I’d try to down size the stuff. It’s tough!!! I love that you shared all the real corners of your house with us. That is why your blog is so great, you keep it real. This is exactly why I follow your blog! I can sooo identify. 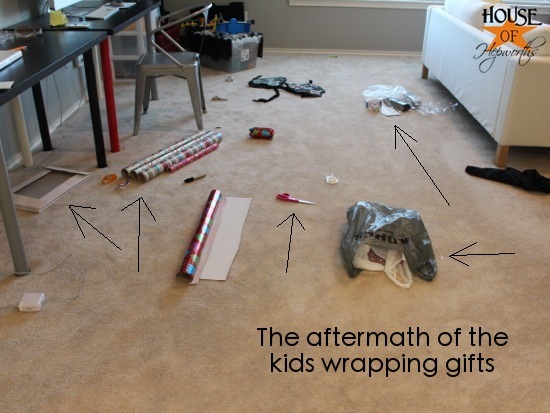 The Sharpie, the wrapping, the clutter, the dust! Today is the day though. The family is home. 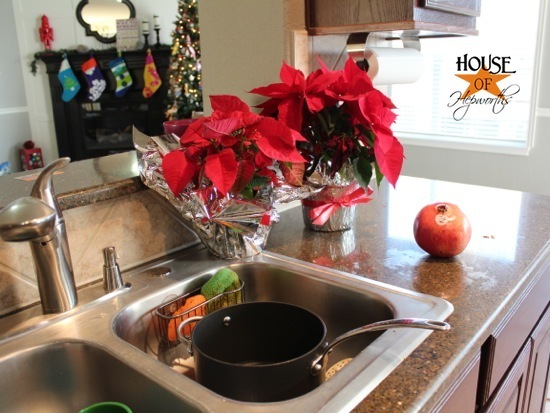 We are wrapping, baking, cleaning-even dusting…It’s going to happen today! Think of it this way, the fact that there is the appearance of chaos, I bet your kids are happy. You have probably been to their school/church programs. I bet you have driven around to see lights. You made sure their special Lego decorations were on display. Who cares if you are a good holiday-er as long as you are a good mama! Thank you so much for sharing! I had such great plans for this year since we had four weeks between Thanksgiving and Christmas. I thought I had enough time to get ready for Christmas. Nope! House is a mess. Some decorations are out, but it’s pretty haphazard around here. I still stress but now I know that it’s only MY crazy ideas & projects . Looks like you have figured it out waaay before I did. Happy, Happy, Joy to you and your family. I thought I was looking at pictures of my house, lol. The only reason why our gingerbread house is done is because my youngest was so excited to make it I couldn’t tell him no. He also decorated the tree by himself while his two older brothers sat on the couch making jokes. Ahhh the memories! Hilarious! Our pre-lit tree might make it up before Christmas Eve but I doubt it. I’m not interested in tree wrangling with a 1 yr old nearby. The in-laws can do it if they want. The decorations….were reduced by 1 bin and the keeper bins are staged in the entry awaiting action. I think my action will be to put them away. Who wants to decorate for 4 days?!?! 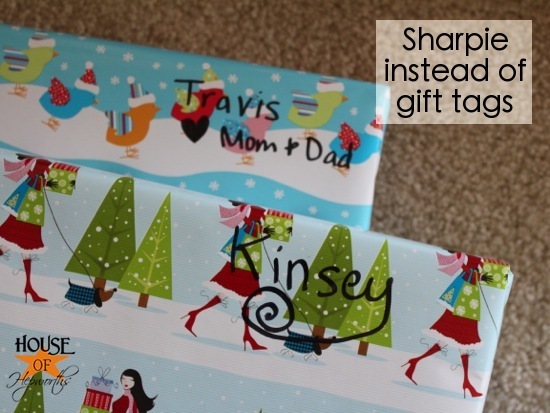 A Sharpie instead of gift labels! The horror! Oh wait, I detest gift labels because I have to find them, write smaller, write more, and find a place to stick them. Plus I’ve ruined more than one wrapped package by forgetting to fill out the label first…i.e. I riped the wrapping paper. So Sharpies are my labeling system. Easy. Fast. Visible. Double sided tape to hang the Christmas cards….that IS my method. I have a dedicated set of cabinets that they go on. They are arranged nicely where everyone can see and enjoy them. I take them down around Easter and put them into a scrapbook. Photo Christmas cards are my favorite thing about the season, so I enjoy looking at them longer. I have never commented on your blog but read faithfully. AMEN SISTER!, is all I have to say! I’m in the same boat this year. Then my sweet mother-in-law (she really is sweet) called me yesterday and said she’s sick, could we please host the Christmas dinner for 14 at my house this year. EEEEK! I love your blog, Allison and I’m like one of the others that commented. I’m sure your kids are remembering that you came to programs and had pillow fights versus the perfect Christmas. 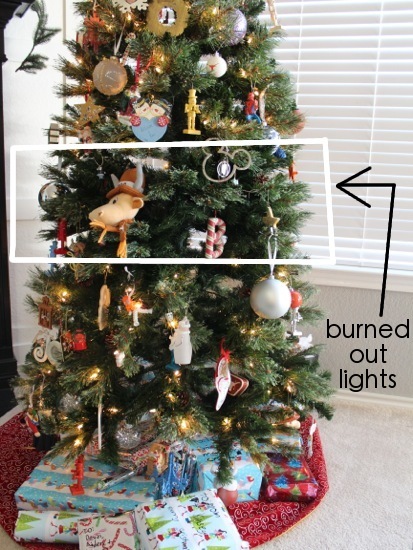 THOSE are the things kids remember – oh and that one strand of lights on the tree was always burned out! lol They’ll never let you live that one down, but it’s a fun memory. Don’t let it bother you! Merry Christmas and thanks for keeping it real! My favorite post yet. It has brought me comfort that I’m not the only one. I always intend to “do Christmas big” this year and I used to. Just don’t seem to have it in me anymore, but I’m okay with that! Love your blog. Merry Christmas Allison and to your family! Oh Allison, I knew there was a reason you were my favorite! Thank you SO MUCH for keeping it real! And now, along with everyone else – to VALIDATE your christmas confessions… here’s a comparison list to show you’re really doing better than some of us! 1. My christmas cards are in a pile on the kitchen counter. I don’t own double stick tape. 2. Never got around to getting (or making) a gingerbread house. 4. Most of our decor is piled on the fireplace…cause that’s where it ended up. 5. The giant red plastic bins of ornaments just got put away. Took 2 whole weeks to get our crap up. 6. Our unwrapped gifts are stuffed under the tree, still in the plastic sacks from the store. awesome. 7. The string of lights on the top of our tree went out. I’ll take care of that wednesday, when the tree comes down. 8. No legos this year, but random kid crap everywhere. 9. I don’t even own decorative pillows – it’s on my list of stuff to get. 10. Sharpies rock. We use them for gifts too! 11. We didn’t even get the kids yearly ornaments yet. Guess i need to do that today. 12. 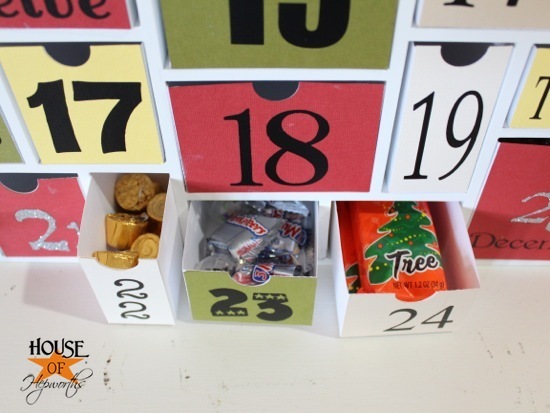 Don’t own an advent calendar, although i’ve pinned 63 of them from Pinterest as inspiration. Mega fail. 13. The only poinsettas i own are plastic/silk that i bought 6 years ago to put on my grandfather’s grave. Probably should go do that one of these days. Maybe after we buy ornaments and a gingerbread house and double stick tape. And pillows. 14. No lights on our house. We actually own them, but haven’t done anything about it. 15. No outdoor decor this year either, can’t find the door wreath. I do have dead annuals in planters out front though. 40 watt bulbs, & dimmer switches, do wonders for dust & floors, at nite. Who can see? Zone defense. Where I live & view is lovely. Don’t go into the other rooms. Dull women have immaculate homes. Anon. Your front porch is perfect for taking all the plants out & replacing with a flagstone terrace, 1″ apart, with evergreen groundcover between. More than doubles the porch. Then you get to anticipate teak benches & historic iron reproduction urn on plinth. Best, you can DIY the stone. Lovely home! And interiors too. Enjoy the chaos. Kids will be out in blink of an eye. I feel so much better now about my own preparations and “decorations!” Thanks for a good laugh and reality check. Hope you have a great Christmas. You have so much more accomplished for Christmas than I have. I let my 5 year old grandson put ornaments on my tree which happens to be the only Christmas decorating done so far and its Dec. 22nd. Gifts are sitting on my dining room table still in the bags I brought them home from the store in (purchased last Monday and its now Saturday). A rescue dog I have has ripped apart all the dog toys and I have white polyfill everywhere which looks like snow (can this be considered Christmas decorations?). No cookies or candy made, no outside lights or decorations. So, I want to thank you for making me feel better about my lack of organization. Wishing you and your family a very Merry Christmas!! Sharpies on gifts…check. 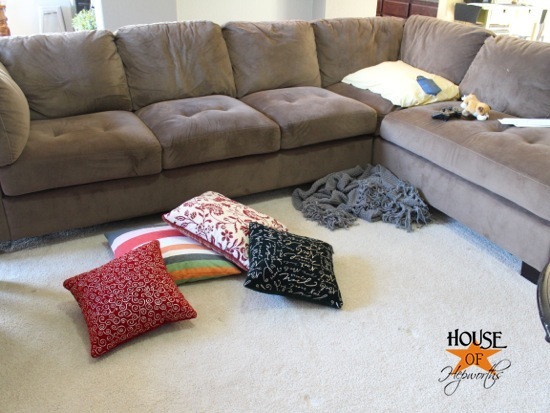 Pillows on floors…..check. Christmas cards to be mailed sitting on table…..check. Literally I am PRAYING that all the gifts I JUST SHIPPED will get to where they need to be BEFORE Christmas and those whose didn’t ge mailed have already gotten a text/email/message saying it will be late…don’t hate me. Girl……too much to do so some things had to go. It is life. It is normal and I LOVE your blog. HAd to choose one? It would be yours as fav….authenticity is hard to beat. So many of us out here can relate……Merry Christmas to you guys! My beautiful handmade wreath was blown off the wall outside my front door. I bought a cheap one at Lowe’s last night that should stand up to the elements better. I am so glad you did this! I have been reading your blog for about a year now. I lived your way for a couple years now in Amarillo. I am used to decorating big for Christmas and usually put up about 4-5 trees and start the first part of December. In October I was diagnosed with stage 2 Breast Cancer and started chemo on December 5. I did good to put a few trees. Some decorations I have had for more than 20 years. This week I came home from work and saw all the decorations I had just sitting on the bar that I had not yet set out, I was saddened and frustrated. I told myself it was ok that this year I could go with less is more. So I packed up what I had not used and threw them in the craft room where my white tree stands undecorated. It was nice to see all the 1/2’s I do. You are not alone. Always remember these are not the things your children will remember, they will not even remember the gifts they get 20 years from now. just being together is what counts. THANK YOU THANK YOU THANK YOU – for not only making me laugh but having a huge weight lifted ……I don’t even have a blog site, to keep up with….. Totally looks like my house! 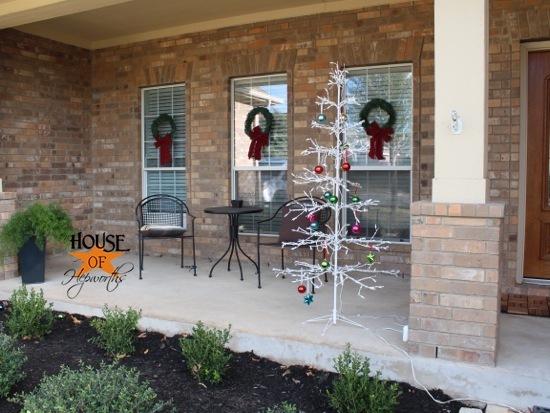 Even have the same tree out front (but mine has no added decorations). My nativity scene is still in the box below the niche where I’ve been meaning to put it for a week. You mean this isn’t normal? God love your cute little heart! What a refreshing post!! I agree with the others that sometimes blogs can start to make us make feel like we are inadequate at house keeping, decorating, creativity, etc. Thank you for keeping it real and reminding us that you are just as human as the rest of us. I LOVE IT!!! Thank you so much for keepin’ it real! I’m convinced all those picture perfect scenes are just to make the rest of us depressed that our lives can’t be that perfect. I really do appreciate you sharing these very real photos. Thank you!!! I always wear myself out trying to make Christmas perfect, no longer!. My daughter and I was discussing past Christmas’ the other day, she remembers the year we had little money and I went to the dollar store and bought a bunch of little toys and wrapped them all separately. She always remembers that year as the best. Go figure. Thank you so much for sharing!! I actually decorated this year and have enjoyed it, not the norm for me at all. I have been using Sharpies on gift wrap for years…can’t be bothered with those little tags. I was surprised to year you say that was a “confession.” I think it’s brilliant! I gave up on bows many years ago; packages stack much more easily without them! We get real trees. It’s one of those traditions that once you start it with kids, it’s hard to stop, even when you want to. Finally just had my husband bring home “any tree, from anywhere, don’t care!” and it’s sitting in the garage. Maybe we’ll get it inside and decorated by Christmas Eve. Last year, I got out our Advent Wreath, and then realized we didn’t have enough candles for it. This year, I bought candles early; can’t find the wreath. My outdoor decor consists of one thing: our single Halloween pumpkin. I’ve been actually avoiding a lot of the Christmas blog postings lately, because they usually just make me feel bad. Yours was the first Christmas post that made me feel happy! You rock. Thanks so much for sharing. I love you. I don’t know you, and now you think I’m a weirdo, but I love you. We actually do have lights on the outside of the house this year, making for only about the 5th year of the 17 we’ve lived in our house. This year has been hard to feel in the Christmas mood as my dad passed away in September, so what little I have accomplished has just been a pretense for my youngest daughter and hubby. I love it! Now I know why I love your blog so much!!! We are so much alike! I love you! Thank you for posting this. I don’t know if it that misery loves company or just to know that it’s ok not to have the Norman Rockwell, Better Homes and Garden Christmas. Maybe you should have a link party for all of us that have a Christmas confession 🙂 Oh, wait, I am too lazy…er busy….to even have a blog! I can’t tell you how many blog posts I’ve seen that made me think I was a true failure for Christmas. This one makes me feel so much better since this is exactly what my house is likel!! Thanks so much for showing us real life! 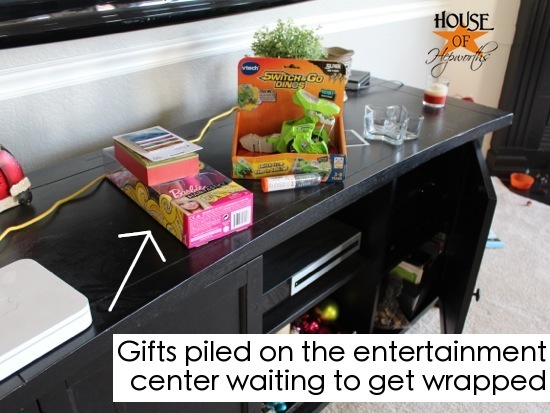 Oh, and sharpie gift tags are a staple at my house… especially since the gift wrapping just started yesterday! Oh, my, I can’t even express how much I LOVE YOU!!! Thank you for being real, normal, and willing to admit it. I think that is how 99% of us are. Thanks for helping us be okay with imperfection. You are my hero! The decor? A MENORAH- (this IS required but there are a million variations) and CANDLES. Yes there are prayers–and a lovely STORY of a miracle! So—lets ADOPT the holiday and get rid of the TRAPPINGS of Christmas that we have let ourselves be tricked into thinking we NEED to do. Every year. For the rest of our lives. I am as you can tell Jewish. However I am also the daughter of an Irish man and the wife of a German Portuguese guy. Neither of which celebrate Hannukah. As a religious preference that is. And for YEARS I thought I had to make a PERFECT CHRISTMAS for them–and other friends and relatives. Now–not so much. We do somethings Christmas–my 6 year old grand daughter and I made a lovely if prickly wreath out of holly growing in our yard–decorated with a battery powered string of star lights–which promptly BLEW OFF THE DOOR in our extreme winds–and took out the front porch light. 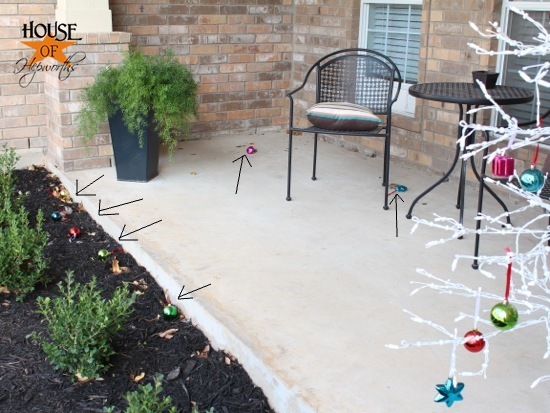 No one can FIND the Christmas light PLUG—these have been ON THE PORCH RAIL FOR A YEAR NOW. The plug—is MIA. Mebbe eaten by the killer holly. The Goat barn however–THAT has Christmas lights. Priorities people! We gave up on a tree because we have a 2 year old here determined to take apart EVERYTHING in or near our house. We DO have a METAL decorative tree sitting on a chest in the living room—near the Menorah! Random ornaments that have wended their way into the house are hung—where ever we can find a spot. If any one who comes over objects–THEY can baby sit the Terrible Two. We have not sent out the pics we had done of the kids–by “Done” I mean I lined them up in front of the decorated trees at Target and took a pic and had Wallyworld print em out. I have also not sent out wedding pics from AUGUST of our youngest kids wedding. I am thinking people will NEED come cheer in maybe–February. Oh—I HAVE the pics. Sitting right here. And the envelopes. Just–not the ambition! Funniest post on the Net right here!!!!!!! Your blog did my heart good! I don’t have little ones at home, but oh, how I can relate! And I’ve decided so much of the stuff we think is important, isn’t really, so don’t kick yourself around. It’s great to see someone in blogland being REAL!! Love the confessions – thank you for keeping it real!!! I absolutely love this. I am NOT the only one as everyone in this house says. YEAH! It is not about any of those things anyway. It is about the love for one another and the joy of just being together. LOVE, LOVE, LOVE, this. Either way, have a mahvelously merry Christmas. Oh, and all that stuff you posted about? It doesn’t even matter. I’m sure you know this. Oh, and p.s. Just to show I’m kind of grinchy on top of lazy…I can’t wait to put all the Christmas stuff away. It’s cluttering up the place! Maybe because T-day was so early this year? And I’ve had it out longer than usual? I dunno. But…yep. Grinch-o, right here. Well Allison, I’m glad I’m not the only one in disarray! It’s life and I’m not on the ball either! Merry Christmas. I’m having a PINTEREST Social hop. I’d love for you to hop on over, grab a button and link up your Pinterest. If you don’t have Pinterest it’s ok, come link up your blog. I’m also looking for Pinterest Pinners to feature every week beginning in January. If you are on Pinterest and are interested in being featured come link up! Who knows you might meet some other great pinners and gain a few great ideas. BEST Christmas decor EVER!! !…..smiles, I am with you girl…. Love this post. My kids play the pillow game too and for the lay two year I use sharpies and address labels for gift tags. Nice to know that we are more alike the. We probably think. I’m pretty sure it’s because you are too busy being kind to other people that you haven’t had time to finish a few things. You are awesome – you’re actually DOING the Christmas thing instead of just LOOKING like it. 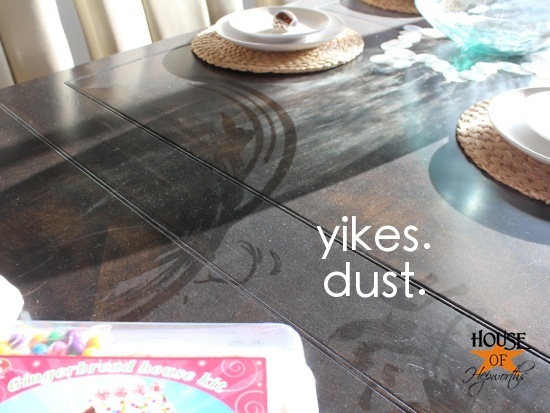 Dust (definitely one of the worst 4-letter words there is). I have a theory about dust. In fact I have several theories about dust but obviously we don’t have time for that. I do have a suggestion, though. Well, more then one suggestion but they all achieve the same thing. 1) Dark furniture – make it a time-out penalty for “anyone” who puts their fingers on it; 2) keep the room dim – during the day pull the curtains and during the evening keep the lights dimmed down; 3) if really in panic-mode because company is coming and you’ve not dusted in the past 4 (did you say years or months?). Here we go! Are you ready for point #3 – glitter! Sprinkle lightly over all dark surfaces and, in keeping with the dim room, everyone will think you are so clever to make everything sparkly and they’ll never see the dust. I also have dark furniture – I know from whence I speak!!!!! Ha!! Thank you so much for sharing your real home with us. It’s easy to look at other blogs and think “what’s wrong with me?! Every other woman out there has a perfect home and can do no wrong!” I loved all of your confessions, but I most related to Legos…why do they have to hurt so much when you step on them?, Sharpies on gifts (I was just doing that myself today), Christmas decorations ending up in a drop zone…well, really all of them. well I could say that made me feel better, but it didn’t I still have way less set up, and well, that is how it’s going to stay;p Merry Christmas! Reading this made my day! Things get so hectic and stressful during the holidays that I’m glad I’m not the only one with an “I really don’t care” attitude right now. And your daughter using the store hook to hang the ornament is priceless!! There are glimmers of hope! Your blog helped today, thinking about how much my family loves the cookies I make helps and knowing how much my husband would appreciate it if I cleaned the bathroom (after I make the cookies…) is an added impetus. I, too, live in Connecticut and this tragedy has really struck hard. In the paper this morning they are talking about taking all the memorials down in Newtown already! I think people still need to go and visit. My nephew and I painted angels on 26 canvasses. After I set that up in Newtown I began to feel better. Before that I was heavy inside. I’m a blogger and I couldn’t blog all that I had prepared. It didn’t feel right to be happy, happy on the blog when 2 towns away people were grieving. Who needs perfect anyway? Your kids will still have an awesome Christmas and great memories, even if it’s not Pinterest quality. 🙂 Merry Christmas! Our tree is up, with no decorations because I don’t want to deal with the tornado that is my son. We decorated the tree last year and within a week the decorations were all broken. My tree is beautiful in its naked state. Actually I do have an elf (who has not moved) just hanging there checking things out. I did not buy presents this year either. I have a job prospect in January, so I just let my parents in law take care of it all. My hubby and I have decided the gifts we want that we will get after I start working and get a handle on our debt, which will be at the end of April sometime. I thought I would be horribly stressed out, but after being unemployed for so long and now with a pretty promising job prospect (I am taking the fact that they want a voided check for payroll purposes as a good sign even if it is technically a prescreening) I am really relaxed. My kids are not going without- we are all together and safe, we are ok! I laughed out loud at the sharpies, because that’s EXACTLY how I’ve labeled gifts for the past several years. My kids don’t care, as long as it’s got their name on it!!! Best Christmas truth post EVER! (sigh) Im NOT Alone..
My table has been full of Christmas decor/craft cr@p for weeks. We did not do a big tree. We are going to Hawaii shortly after and I didn’t want to deal with taking it down. I didn’t mail Xmas cards. I got 5, they are sitting on my desk. I just finished lunch, and blog browsing, I better go get them done!! BAHA! I seriously loved reading this post! I think Pinterest has given all of us some kind of fiction world that can never be achieved and it makes me discouraged when I can’t make things perfect. I’m glad to know that I’m not the only one that didn’t live up to my Pinterest fantasies this year! 🙂 Thank you for portraying the real you. It’s so nice to see that in the blogging world! 🙂 Hope you had a Merry Christmas, girl. Thank you! Thank you! Thank you! We have a bit more decorating done because the kids just took it upon themselves (7 & 10) to lug stuff up and set it out some mismatched Christmas montages around the living room (that they love) but I related to most of this on most levels…and we don’t play the pillow game. We play the afghan game. I fold it over the back of the couch and when I come back, it’s crumpled on the couch again. Rinse. Repeat. It was very “brave” and hilarious of you to share! haha I made a similar post. Good to meet you, a like minded friend. Happy New Year. Love love love your confessions! Especially the ornaments with the tags. We didn’t decorate the outside of the house this year either. At least it makes un-decorating easier right? Hope you had a wonderful Christmas! I laughed all the way through this post! Love it! LOVE IT!!!!!!!!!! Glad to see you are “normal” like the rest of us, lol. This is my kind of post. We put up our Christmas decorations (including tree) on the 21st, about an hour before my mother walked in the door to visit for 3 days. Ha! I love this! We are moving this month, so our decorating was worse than this even…shocking right? 🙂 Thanks for keeping it real! Like many others have said: THANK YOU!! THANK YOU!! THANK YOU!!! Thank you for such a funny post…it had me rolling! Loved the Christmas tree falling over on the front porch and the ornaments everywhere! Hysterical. Hope you had Merry Christmas and I’m sure it was ..you seem to know how to keep the merry in Christmas. Happy New Year! Cheers! i am also one of those readers that never writes but this just screams for a comment… you had everyone who read this laughing to the point of tears!!! at least i was! i am usually semi under control at christmas but this year you and i had identical holidays. crap everywhere and i just didn’t care! totally feeling u with the… theres always next year line i just kept saying it over and over!! well happy new year and lets hope we r better at this next year! OMG…. thank you for posting this. I always feel like such a failure this time of year. I’m NOT the one to go all out with the decorating or do all the fancy wrapping with homemade bows, etc. Goodness knows, I wish I were, I guess I’m just not wired that way. I too will often use a sharpie to label gifts OR if I use a recycled bag with a gift tag still on it, I might use correction tape and reuse that name tag. Yeah – I know….. I think I have several ornaments that also still have the price tag on them. I work full time, and have 2 young sons (and hubby) who keep me extremely busy and create an insane amount of laundry. I don’t have time to do all that stuff and sleep too. Your house is alot like mine this year! I only put up the tree and the Nativity! The rest were in boxes in the living room! I don’t even know if I opened all of the Christmas mail yet. To add to that my daughter who graduated from college moved back home so there are boxes in the foyer for her to put away! I just took down the tree and my son is coming over to put the boxes back in the attic that he took down a few weeks ago! I find nothing wrong with anything you’ve done! We are all in the same boat! Christmas is over and I promised myself that all will go smoother next year….same as I promised myself last year and the year before. Truth is, I am no Martha and I just have to come to terms with it I guess. I stll long for the perfect, relaxed, beautiful, meaningful Christmas. Never had it. But I will keep trying, year, after year. Crazy woman!!!! THANK YOU for keeping it real. I actually read a blog regularly to say “OMG…how can anyone be so perfect?” I can’t believe people REALLY live like that. I love that you are open and honest. And…if I was a betting woman…I’d bet your family is much happier and well-adjusted than the “perfect” blogger I read for amusement. Loved reading it. You are so normal. Thanks for keeping it real. I absolutely loved this post!!! I am right there with you on so many things on your list. I made myself crazy when every other blog that I follow started posting their beautifully decorated homes THE DAY AFTER THANKSGIVING!!!!!! Ok – some of them didn’t even wait that long. Ugh. And now I’m seeing Valentine’s Day and it’s still December!!! I could cry. As you said – there’s always next year! This is one of the best blog posts I have read all season. This is my first time commenting on your site but I must tell you as a blogger who has written similar topics (my specialty is Pinterest Fails especially in the crafting category) this made me smile. Happy New Year to you and yours! I’ve done a lot less decorating for Christmas this year. I did get cards mailed out, and have received several – including three (count ’em – 3) from my 90 year old aunt. One envelope didn’t have my zip code written on it, but USPS knew where to send it! I love my Auntie!! I feel like cleaning everything up and putting it all away already. I used to leave it all up until Valentines Day (well, once I left my wreath up that long). Not much has changed in my life, but everything just feels different this year. That is one funny post 🙂 Thanks for keeping it real. This is why I love your blog –’cause it is evidence that I am not the only woman out there who is not SuPeRwOmAn… 🙂 HAPPY NEW YEAR!! I can SO relate to the Sharpie for putting names on gifts! Did that very thing this year! ha! Well in a warped way, I am glad to know that I am not the only one who never made it to decorating this year either. Sad to say we managed to get the tree drug up to the LR but never got a single ornament on it. Just crazy horrible year. Mom passing away from cancer and hubby working 2 jobs. Just be glad you all can recover. accidently posted on your giveway comments. next year has got to be better, right? I’m late to this post but have to admit it makes me feel so much better about my dismal attempts this year! I actually had to stop reading all those “house tour” blog posts because it made me feel so terrible about my lame decor! So thank you for keeping it real! so happy to read this! the pillows off the couch got me. that is totally my house. why can’t they keep them on the couch??? and last year i hung my cards in a cute christmas tree shape, this year they ended up in a pile on my buffet. oh well! I just can’t believe all the comments from people saying they can’t find time to decorate for Christmas! I decided to recreate a winter wonderland in my home! I chopped down a tree in my backyard, ran it through a wood chipper, pounded the pulp and made my own paper for my Christmas cards. Then I crocheted a large red and white 12′ x 12′ rug for the family room (using the smallest crochet thread available) . After that I hand-carved the entire Nativity scene from teak I had stored in my garage. It was that or the sail boat I was thinking about building. On Christmas eve, I had twenty-five guest over for a five course dinner, all cooked by me, of course. I have to admit, plucking that goose was a b#$ch, but nothing is too good for my family . p.s. the wreath made it on the door! Thank you for this post. I thought it was just me who had a huge pile of Christmas projects that were meant to be done, but didn’t quite get completed. Those beautiful house tours took my breath away, but also made me feel like a big loser!